Whether by train, tram, bus or metro – discover Amsterdam in 1, 2 or 3 days! 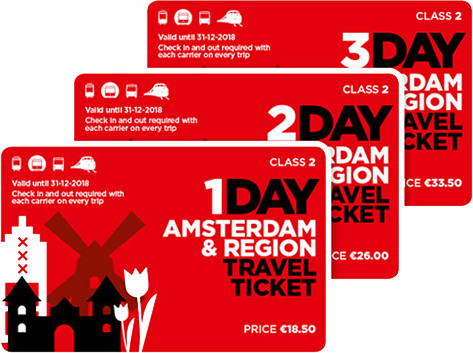 With the Amsterdam & Region Travel Ticket, you can travel across Amsterdam and region without limits for the chosen days. Make your way around the Dutch capital and all its interesting sights outside the city with a travel ticket that's valid on trains, trams, buses and the metro. A local map and suggestions for sightseeing is included, so you won't miss the highlights of Amsterdam and its complete region. Save money by buying a 2-day or 3-day ticket and get a discount. Pay €18.50 for 1 day, €26 for 2 days and €33.50 for 3 days. After you’ve got your transport sorted comes the fun part – deciding what you want to see. Explore the canal rings to soak up the great atmosphere and find authentic shops. Visit the Rijksmuseum for some serious culture and the Anne Frank House for a touch of history. Or find out about the windmills at the Zaanse Schans, the old harbor villages of Volendam and Marken or the beautiful old city of Haarlem. 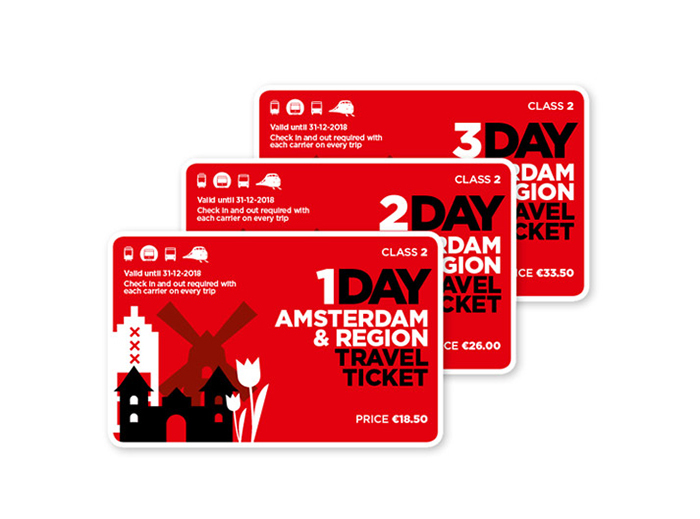 Get around Amsterdam the easy way with the Amsterdam & Region Travel Ticket. Depending on the length of your stay, choose between 1, 2 or 3 day tickets. Make your way around the Dutch capital with a travel ticket that's valid on trains, trams, buses and the metro. 1-day (€ 19.50), 2-day (€ 28) and 3-day (€ 36.50) tickets are available. This ticket is valid for 1, 2 or 3 consecutive days. A day in this context begins at 00:00 AM and ends the next day at 04:00 AM. The validity starts from the moment you check in for the first time.